The former Oasis guitarist and songwriter is on course to top the album charts on Sunday with his debut release, Noel Gallagher's High Flying Birds. Liam's post-Oasis band Beady Eye peaked only at number three when they released Different Gear, Still Speeding last year. Noel's album is outselling nearest chart rival Matt Cardle, last year's X Factor winner, by two to one so far this week, according to figures from the Official Charts Company. The pair look set to nudge Steps - this week's number one act - down to number three with their Ultimate Collection on Sunday. Matt has insisted he wishes his chart rival all the best in the race to the top spot. 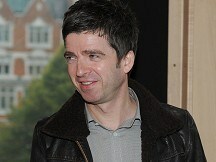 He said: "Noel is quite a legend to be fair. I haven't heard the whole album - I've heard some tracks and they're great - but I wish him all the best." The Wanted are expected to have the number one single with Lightning, their third chart-topper.